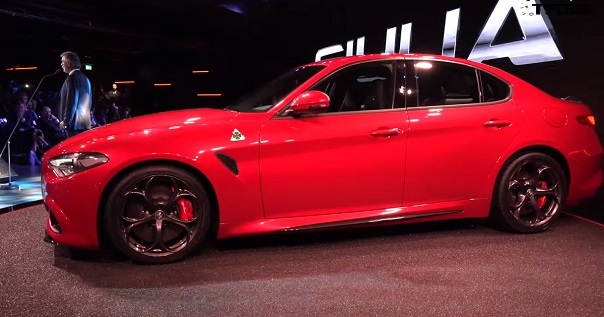 The new Alfa Romeo Giulia — gorgeous Italian sedan. June 24, 2015 to restore the museum Alfa Romeo was in all its glory is represented by the successor of the famous Alfa Romeo 159 — Alfa Romeo Giulia. Four Italian sedan, according to company executives, is the embodiment of all the best qualities of the brand in its history (more than one hundred years). If a more detailed look at the car, you can easily find a confirmation of the words bosses Alfa Romeo. Obviously, the car and want to be compared to his classmates from Germany — BMW M3 and the first impressions test drivers, the Italians more chances to win. It should be noted that this year renewed rival Chevrolet Malibu. In Russia, the Italian supercar will only be available in rear wheel drive format. Like all the fans of the expected trends in the automotive sector, the car will be officially unveiled at the Frankfurt Motor Show in Germany, in mid-September of this year. Naturally, many wealthy people will want to immediately buy a gorgeous gift, but those will have to wait until the spring of 2016, it was during this period pripadaet the massive sales. At that time, when it became fashionable to be like the producers in their decisions at each other, the Italian brand continues to dictate their ideas and desires. New made in the sports style and this can be seen in each of its exterior details. In front are two false radiator grille, which is wound way of aggression and determination. Along with aggressive design traced notes of Italian elegance. At every bend of the body, each line can be seen flowing handwriting hands of professionals, who worked for a long time to create such a miracle. Which is located behind a small trunk lid spoiler unusual, surround bumper and two pipes of the exhaust system. Whatever ultramodern and evolve the car was not new Alfa Romeo Giulia, in its figure felt the echoes of past models. Images of past models were quite superb, and when they are all combined into one — came what we call perfection. Body trends become more stringent, and the curb weight has decreased by several times, because the doors and the rear of the wings are made of aluminum alloy, and the roof, hood and propeller shaft of high quality materials and high-strength steel. If we assume that the car is all-wheel drive and install it the most powerful engine, its weight will not pass the mark of a half ton. LEDs on the back of doing the lights at night is more vivid and gives a feeling of stability and security. The headlights look big enough, yet perfectly in tune with all the details on the front of the car. At any time they will not let the driver, as made of modern materials and highly qualified specialists, who will not allow their creation does not work as it should. The most interesting version is probably the three-liter petrol model with a V6 engine and a power of 510 hp It should be noted that the engine, borrowed from the company Ferrari, allows you to accelerate to the first hundred in less than 4 seconds. In the future, will be released as diesel and petrol versions of V6, but the power will be somewhat less. Treat yourself to a toy will be in early 2016. Prices, according to the bosses of the Italian company will be known before the actual start of sales. In Italy, the reception at Julia orders will begin in December. So far known only approximate price version Quadrifoglio — from 79 000 euros. but the Italians kept secret details. But at the disposal of publication Autoevolution turned all the data about the engine range for Julia. «Charged» version Quadrifoglio transfer any hundred in just 3.9 seconds. The dynamic characteristics of other modifications have not yet named. The scheme will enter a two-liter petrol «turbochetvёrka» in forcing three versions: 180, 250 and 300 hp Diesel engines even more — turbo engine volume of 2.2 liters (135, 180 and 210 troops), and the three-liter V6 (this motor is installed on the Maserati Ghibli and the Jeep Grand Cherokee) capacity of approximately 340 hp Gasoline and diesel, «four» specially designed for Julia, their production will be set up at the factory in the Italian town of Termoli.